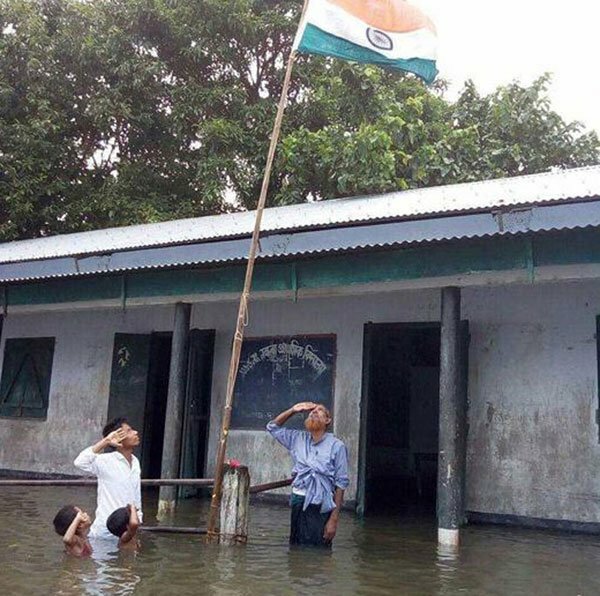 This independence day, somewhere around 11.30 in the morning when I went online on facebook to upload my picture with the national flag to flaunt my patriotism, I noticed a post in which few people were saluting the national flag standing in waist deep water in front of a primary school building. I just hit a like, as it was not at all ignore-able but I thought somebody might have intentionally created such a scene to fetch thousands of likes on social platform. However, this morning the news paper front page with the same picture helped me understand that it was not artificial. This picture was taken by Joydev Roy who is Assistant Teacher in Naskara Lower Primary school. The other four personalities in the picture are Tazem Sikdar (the Headmaster of the school), Miznur Rehman (a teacher in the school) and two of the third standard students of the school. They all are standing inside water due to school premises affected by flood in the state to celebrate the national day. 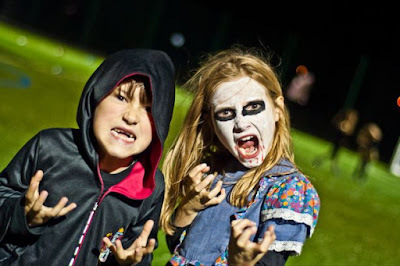 According to credible sources, these are not the only two students of the school attending to the remarkable function on 15th August in the school, there are other students who are made to watch the ceremony from a nearly road as they don’t know how to swim and it may be dangerous for them to go in such deep water. Assam is a north eastern state in our country which is in news due to flood almost every year I remember. I don’t really understand why the government does not make sufficient arrangements in the state where lakhs of people suffer deserter every year. Many people look at north eastern as foreigners in other states of the country and a news from this state hardly matters for most of the news channels. Despite all this, the picture shows us an example of true patriotism for the country. Many people hesitate in standing for 52 seconds in cinema hall. Many people sit at home on 15th August as it might be raining outside. But there are many who perform the ritual against all odds.